The society’s Kitty party was at full bloom. The ladies were chatting and eating at the same time spreading bits and pieces of food from the mouth here and there while talking. Few members were yet to come so the games had not begun. Tanya and Samira were flatmates. They’ve just been transferred from the New York branch of their office to the Delhi branch and the society people were curious about them. The lift door opened and they were standing infront of the apartment where they were invited. 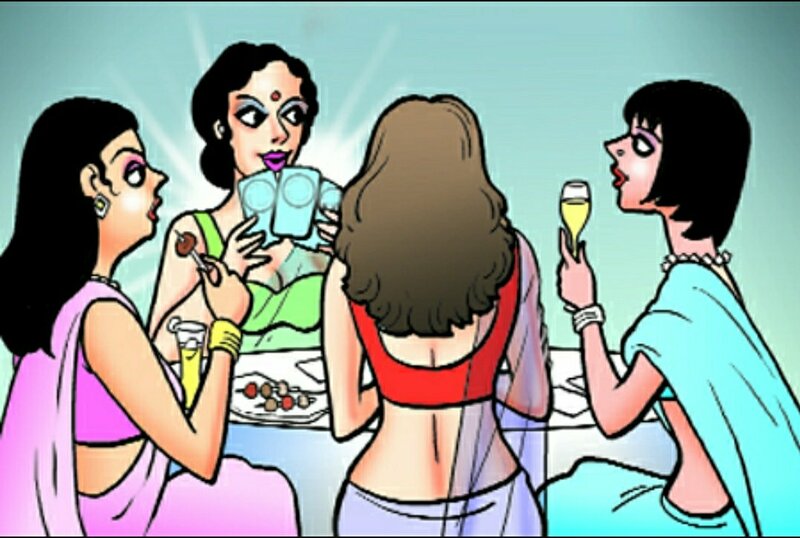 There was lot of noise of bollywood music mixed with the chatting of nearly 15 ladies inside, all talking together on the top of their voice. They rung the bell and waited. Mrs. Mehta opened the door and hugged both of them. All of them walked in and suddenly all the ladies were quitely looking at both of them. Obviously, when most of the ladies were in their tacky salwar kameej and sarees, few tried to look modern and wore fitted jeans, that could rip any moment, and tight kurtis, showing off their assets, Tanya and Samira were dressed in the most different way. Tanya wore a tight knee length designer dress on her lean body and had a Gucci clutch with Louboutins, while Samira was wearing a branded pencil skirt with a baggy crop top. She had a Louis Vuitton bag and wore Aldo heels. After looking around Tanya gave Samira a stern look and Samira pleaded with her eyes. Mrs. Mehta had to poke them to come out of their nightmare and then push them forward to sit. Everyone was still looking at them and was getting more and more curious to know them. They sat and took a glass of a Mango drink served by Mrs. Mehta’s domestic help. Mrs. Mehta then introduced everyone and they all started talking again.All the ladies were talking to each other and asking if anyone knew who they were in muted voice. Anyways, the games began and they all started to play and eat and talk, all at the same time. Hours went by and Samira and Tanya left the party with the other ladies. The women inside them had just jumped out and showed up at the topic of a maid. And then started the harmless bantering and bitching and they never knew when they were a part of the gang. “Maids”, “Mother in law”, “Husband”, “Children” and “Shopping” are the topics that unite every women. There were “don’t tell anyone, I am just telling you” and “I don’t know what does she think of herself” and “Do you know this?” and “yes I saw it with my own eyes” repeatedly and no matter how chic Tanya’s and Samira’s appearance was, inside they were just WOMEN. Posted on September 13, 2017 October 31, 2017 Categories UncategorizedTags fun, kitty party, modern, women5 Comments on Women will be women! !